slopes known as East Myne and West Myne. three parts: Higher town, Lower town and Quay (Key) town. 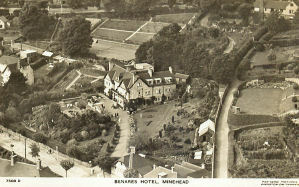 In 1087 the Manor of Minehead was held by the Saxon Chief Aelgar, Earl of Mercia, son of Lady Godiva. The population was 69! 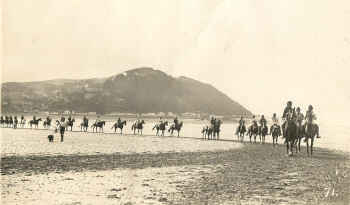 In 1265 William de Berkeley and a Welsh horde invaded and were driven back into the sea. Minehead was bought by Lady Elizabeth Luttrell in the 1400's for 10000 marks and in 1421 she contributed ten shillings to provide a wooden jetty for the town. 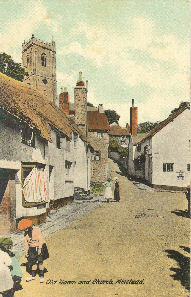 In a survey c.1740 are the names of the streets at that time (with original spelling): Minehead Key, Puddle Street, Friday Street, Bampton Street, Butts Lane, Ffrog Street, Middle Street, New Street, leading home from the Church, Ffishers Lane, Heron Lane, Lane between the Church and St.Michael's Well, Higher towne, Street from Vicarage House to Moore. Some of the Inns mentioned were: The Key, The Lambe, The Kings Armes ''which is a good house and stables built on the wharfe gainst the sea'' The Newe Inn and The Crooked Fish. Near Holloway Foot, Gregory Togg holds a dwelling house and also a fishing weare upon the seashore called Labbies weare, On the east side of Ffrog street is the 'Angel Inn'. 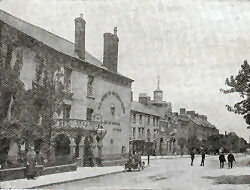 Three Inns were situated in the Market Place: 'The Royal Oake', 'The Rose and Crown', and 'The George'. There was a further Inn in Bampton street named 'The White Horse Inn'. 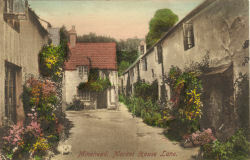 Lower towne is not the central part of Minehead, it once consisted mainly of low, old-fashioned houses, covered with myrtle and roses right up to the eaves. A lane, which was scarcely more than a waterway, led up from the sea. This lane, which was called in medievil times 'La Lane' remained in much the same condition until the end of the 19th century. A raised causeway gave a place for walkers and on the south side was a fine row of Elm trees for some distance. On the right hand side of this lane there was a tannery (it was burnt down in the first great fire). It used to be where the main carpark is today - the cinema (now another supermarket) was opened between the tannery and the main street in 1934 click here to see actual video of the opening of the cinema. Terrace. The whole road is now Blenheim Road. If you turn up Northfield road (once named 'Field Lane') you will see a lane on your right. This is the other part of the 'new road to the Quay'. The Parade, then called Puddle Street, had a block of houses in the middle of it. The Town Hall was an isolated building, and Market Place Lane ran around it, by the Almshouses and the ancient market cross to Frog Street. 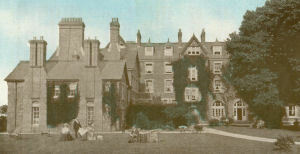 The space now called Wellington Square was also obstructed by houses. Here stood the 'Island House'. 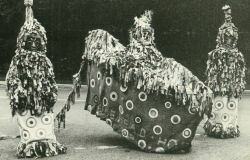 on the right was Frog Street, now called Holloway Steet. The HSBC bank was a music warhouse around1880 owned by a Mrs.Bridgers. 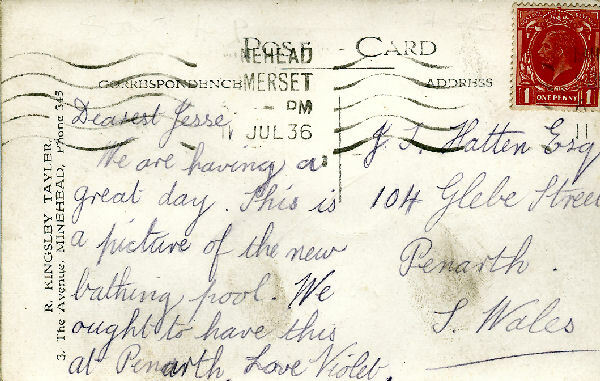 It then became a post office run by Mrs. Catherine Kinnersley - her husband was a local photographer. Henry Woods second hand shop was once the Cozy Cinema. It is now flats. 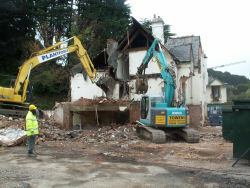 In the picture below the Plume of Feathers is seaward facing and is joined to a property on the left of the picture. some of the other pictures on this page. 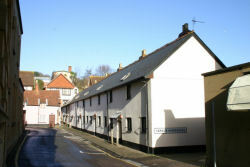 The Town Mill, (now Stonemill Court) stands near where the water Mill was in Doomsday times, near the bottom of Bampton Street. 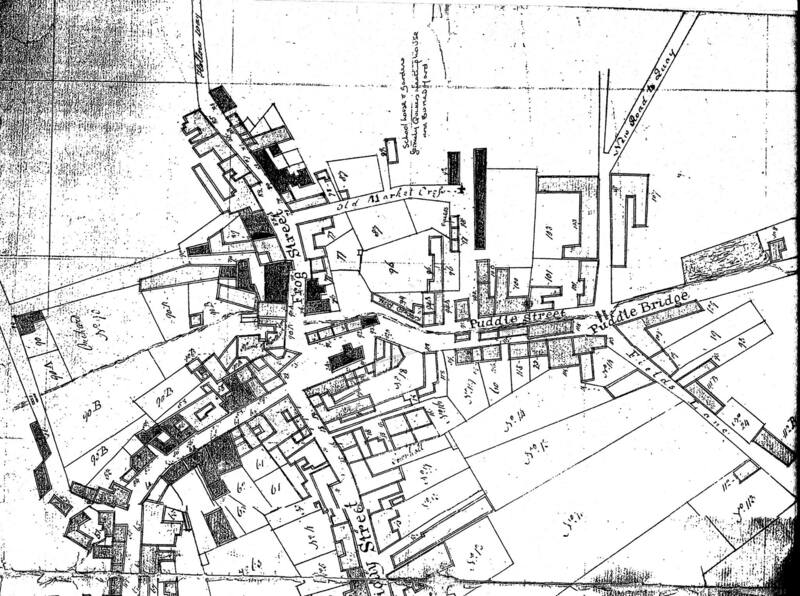 In 1830 the six main streets were, Frog street (now the Holloway) Bampton street (the road to Bampton) Friday street, The Butts where archery was taught is now Selborne Place, Middle street and The Parade. There was a regular coach service with Taunton and Bridgwater at that time. 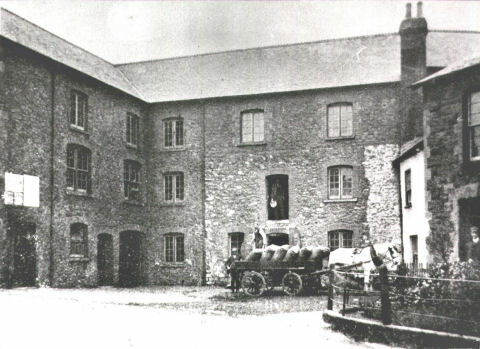 A Tucking Mill stood on the site of the Methodist Church, not far from Puddle Bridge by the Old Priory. Also located near the bridge were the stocks and pillary. The Old Priory is one of the most ancient buildings in the town. There is no proof that the building was ever a priory but it may once have been used as a lodging house for monks. 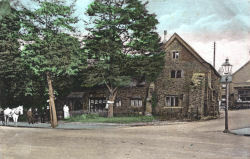 It was later used as the Manor Court and the Dunster Manor Estate Office and partly as a restaurant and tea room. The Minehead Court rolls reveal a striking picture of the absolute authority which the lord of the manor exercised within its boundary. In his court the officers of the town were chosen. Neighbours quarrelled much as they do now, only in a more lawless fashion. There were poachers in those days; for even in those early times the lords court directs that no tenant shall trespass on a neighbours ground 'with bow and arrows'. Others are complained of as 'common fence breakers'. A lady strong of arm, at the quay, assaulted another with a 'fysshe ketil'(fish kettle). On the foreshore, the fishing rights were all in the Lords hands, either held by him or leased by him on lives. All great fish, such as sturgeon, salmon, and the like, were of duty bound sent to Dunster Castle. All seaweed too was the Lords property and the right of removing it was rented, occasionally by tenants. 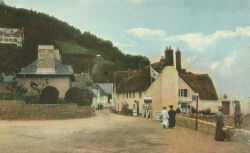 The Estates of Dunster passed from the de Mohuns to the Luttrells in the 1300's and now belongs to the National Trust. In the 15th Century there were three main towns of Minehead: Middle Town - around the Priory, Higher Town - by St. Micheals Church on the hill and Quay Town - by the sea. 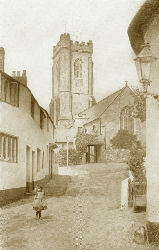 The building on the left at the foot of church steps (behind the 2 people in the right hand picture)with barred windows was not a prison, as many think. 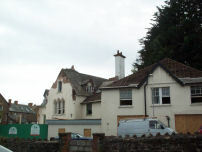 The red sandstone building was Minehead’s earliest workhouse and was used to house the poor in 1731. The building was later used as a mint and the grills on some of the windows still remain. The house on the opposite side of the steps was once a schoolhouse run by Mr.William Lewry and his wife Sarah. Maybe some of the school children are in the right hand postcard. Quay town had a wooden jetty before the harbour was built, it was near the end of todays Blenheim road, by Lamb Cottage and Beach House, it was built in the 1400's and Lady Luttrell contributed ten shillings towards the cost. 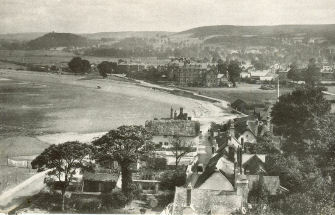 Lamb cottage was removed in 1902 and Beach house was not removed until the 1920's. The other houses on the seaward side of Quay Street were removed after the great storm of 1912. Pass mouse over picture to see how it looks now. The Luttrells provided the town with a stone harbour, completed in 1616. It was enlarged to its present length of 700ft in 1901. 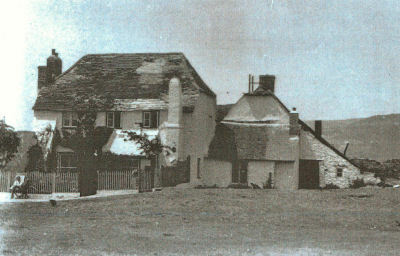 Two buildings which were taverns in the 17th century still stand. One, The Black Boy Inne, is halfway up Bampton Street on the right hand side , opposite Selborne Place which used to be called 'The Butts'. It is now cottages but still has the mounting block beside the wall at the higher end. 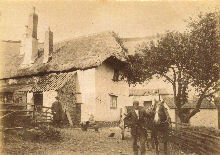 Lower Moor Farmhouse was the other(see picture below)once called 'The Postboy Inne'. There was a fire in 1791 which destroyed over 80 houses. 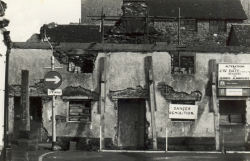 The greater part of Quay town and Middle town were burnt down. A quote from a letter at the time, gives us the following account of what happened: "Last Tuesday noon, Edward May, a miller of this place, was trying an experiment by burning a tar barrel, when the wind being very high, the fire communicated to a large stack of furze that stood in his yard, which instantly got into a blaze and spread with the greatest rapidity into the adjoining dwellings, so that before the next morning upwards of seventy-two houses, comprising almost the whole of the Middle Town, were reduced to ashes. By this terrible and sudden fire, the center of this once respectable and flourishing town is now become a heap of ruins. Amongst the few good houses which providentially escaped the general conflagration are those of Mrs Davis, Mr Warren, Mr H.Ball and a few others. One life only was lost, that of Mr.D.Price, a poor maniac, who, being confined ,was, in the hurry and confusion, forgotten, till too late. What adds to this heavy affliction is, that few, if any, of the houses were insured. The great loss of the sufferers cannot yet be ascertained. - Annual Chronicle, July 10th, 1791". In 1685 during the Civil War, when the Duke of Monmouth lead a revolt against James II, many men from Minehead rallied to his side. 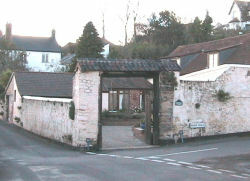 After his defeat, 6 of the captured rebels were brought back to Minehead and hanged from the great beam over the arched gateway at the corner of Lower Moor road. It is a grim reminder of those times and no doubt accounts for the many ghost stories once told about the old place which once was the hangmans yard~ pictured below ~ later it was a stable block where Mrs Webber kept some of her donkeys and ponies that were used on the beach during the summer. Now it has been converted to living accomodation. In 1722 the writer Daniel Defoe (he wrote Robinson Crusoe) stayed in Minehead, at the Plume of Feathers, a much loved, beautiful old coaching Inn which once stood in pride of place, in Wellington Square and was wrote praising the building and the service he received there. Incidently he then visited Watchet in 1824 and was impressed by the remarkable fossils he found. These can still be found on nearby beaches. 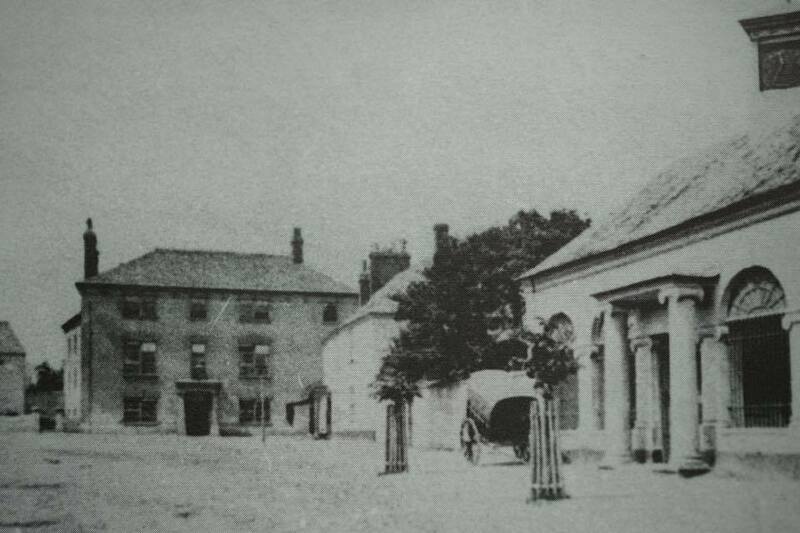 Also in the square is the Duke of Wellington Hotel built in 1820 and enlarged in 1880. It was a disaster and a great loss to the town when The Plume of Feathers was demolished in 1965, to build a modern block of shops. Pass mouse over to see how it looks now! But this too, has now been demolished in 2003 and a new large block of retirement flats have been built there - pass mouse over to see. 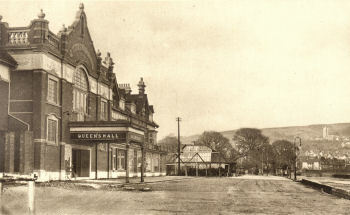 The Queens Hall Theatre hosted such great names as Pavlova and her ballet company and other touring theatrical companies. 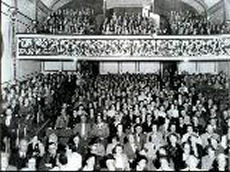 It was also the venue for Mineheads first talkie films that were shown there in1930. It then became an amusement arcade and recently converted back to a family entertainments center with a bar and a huge TV to show sporting fixtures and other live entertainment, owned by Mr Marcus Kravis. The building to the right was the Stand Cafe with a railed balcony above. 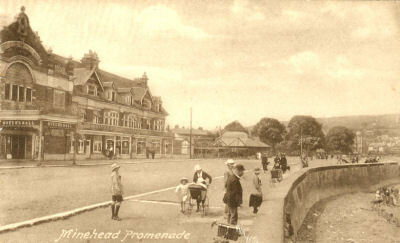 It is now the Strand Restaurant and the railings have disappeared although the patio doors can still be seen. To the right of that, what looks like a building under construction was the framework for a tented theatre known as the Arcadia. It stood on the site of an open air theatre which had hosted Pierrot shows. 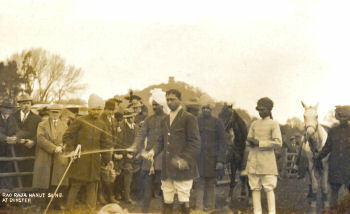 This tent was replaced by a wooden building called the Gaity Theatre. 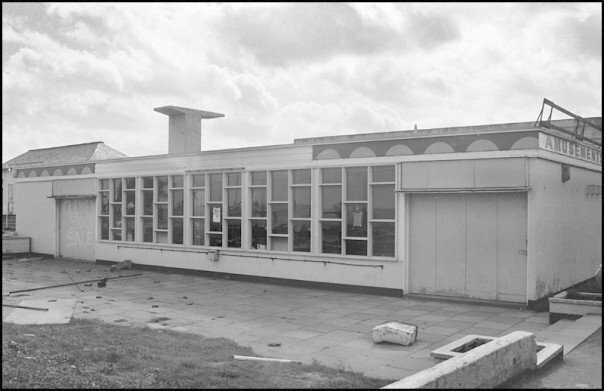 It was demolished in 1979 along with the Victorian toilet block with its large brass locks and green tiles :) to make way for the Carousel, another amusement arcade. picture below show the Queens from the other side and also the audience enjoying a show. 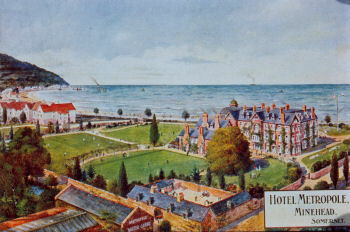 The Railway reached Minehead in 1874 and the Beach Hotel was built to co-inside. and the Avenue was called Station Road. 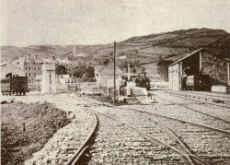 British Railways closed the branch line from Taunton to Minehead in 1971 as part of the Beeching cuts, and almost all the facilities at Minehead station were removed. The WSR came to the rescue that same year. Somerset County Council bought the branch line and then leased it to the WSR. On 21 December 1975, the WSR was able to run its first train from Bishops Lydeard to Minehead. In the next few years, the WSR reopened the line bit by bit, starting from Minehead. By 1979, the line had been reopened all the way from Minehead back to Bishops Lydeard. Clevelands - the building up on the right as you pass the church, was built and opened in 1877 by Thomas Lomas who was living there in 1891. He also built and owned the Bristol Channel Chemical works at the Quay, built in 1872. He sold Clevelands to the Baroness de Tainteignes in 1899. She used to often come down into the town in her carriage, complete with coachman. It is now flats. A new Town Hall was built in 1889 and is now our present hospital. Below is a picture taken during first world war with some soldiers standing outside. The Market house was erected in 1901 to replace the smaller one, then known as the Fish Market. Pass mouse over to see same view in 1930. Notice the Plume of Feathers at the top centre of picture. 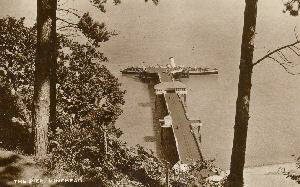 The Pier was officially opened by Mr.G.F.Luttrell on May 25th 1901. It was designed by Mt John Webster and built at a cost of £12000. It was 700ft long and 24ft wide expanding to 76ft at the end. It was 20ft above high water at ordinary spring tides.There were 4 landing stages, beyond the head, allowing steamers to call at any stage of the tide and a luggage trolley that ran up the centre. 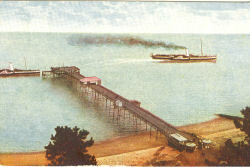 The Campbell White funnel Steamboat company purchased the pier in October 1921. The castle like building half way up North hill by the war memorial is called Elgin Towers. The Almshouses pictured above were given to the town in 1630 by Robert Quirke. He was a master mariner. His ship ran into a storm a few days out from his home in Minehead. He and his whole crew promised God that if they survived the storm and reached home safely, the ship and cargo would be sold and the money used to help the poor and needy of Minehead. True to his word he had these houses built and the income for their upkeep was obtained by leasing out his two cellars on the Quay. In 1910 they became St.Peters Mission Chapel. 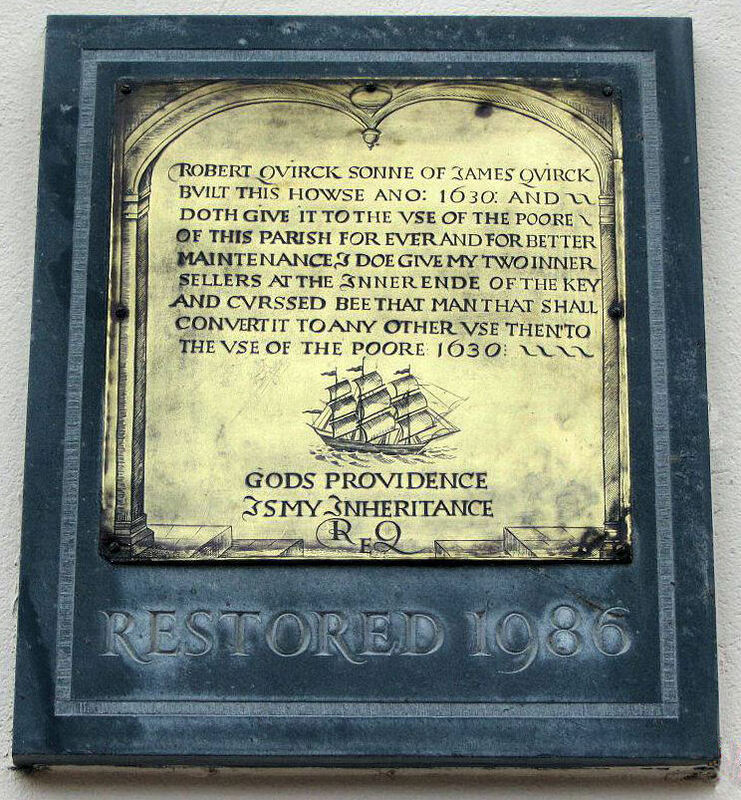 The information is displayed on a brass plate fixed to the centre cottage under and engraving of a three-masted sailing ship, pictured below - actually says " Robert Qvirck sonne of James Qvirck bvilt this howse ano:1630 and doth give it to the vse of the poore of this parish for ever and for better maintenance doe give my two inner sellers at the inner ende of the key and cvrssed bee that man that shall convert it to any other vse then to the vse of the poore. The original ships bell is mounted on the roof of the end house. The houses were built on the site of the old market place and the remains of the market cross can still be seen - it is on the left hand side of the 3rd picture, showing the renovations taking place in 1986. 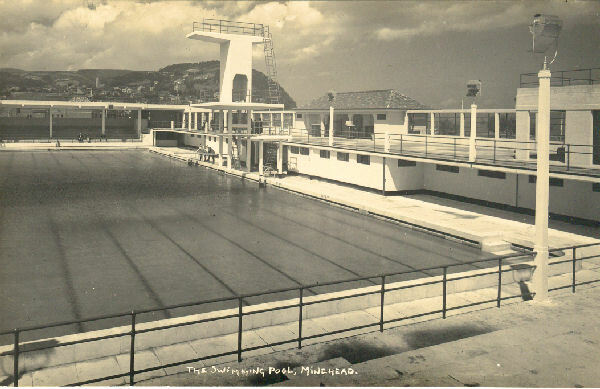 In 1936 a magnificent open air, filtered seawater, swimming pool was built, the only one in the country to olympic standards. It was the envy of many other towns. It was paid for by the Luttrell family of Dunster Castle, for the people of Minehead to enjoy. 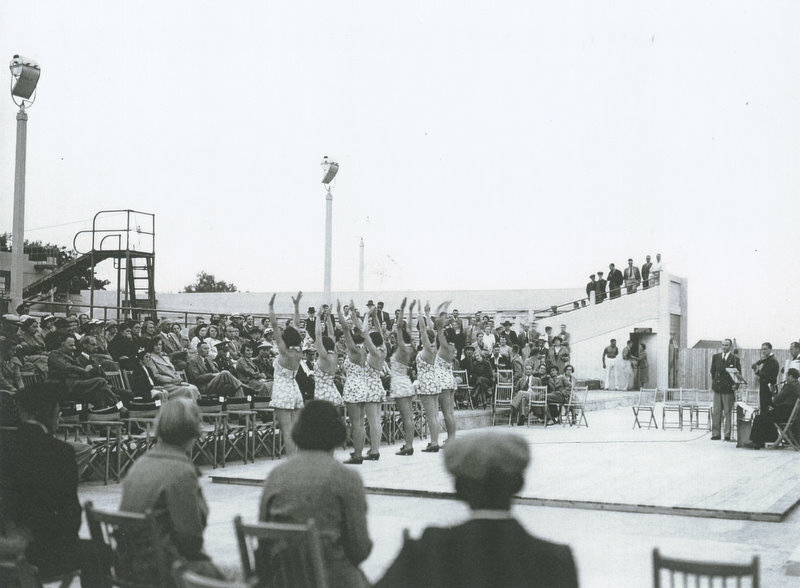 spent at the floodlit Galas with games of water polo and diving exhibitions. 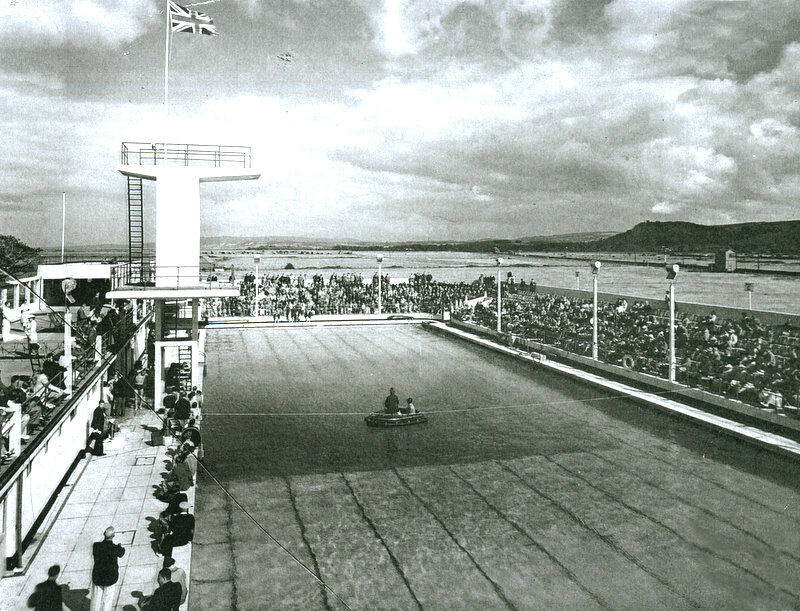 2000 people attended the opening of their magnificent bathing pool in June 1936. Despite poor weather conditions and forecasts, the crowds were not deterred, and they were rewarded by a sudden weather change and a spectacular Gala. Sir Robert Horne payed tribute to “An Adventurous Spirit.” Other dignitaries and spectators were delighted with the aquatic entertainment. 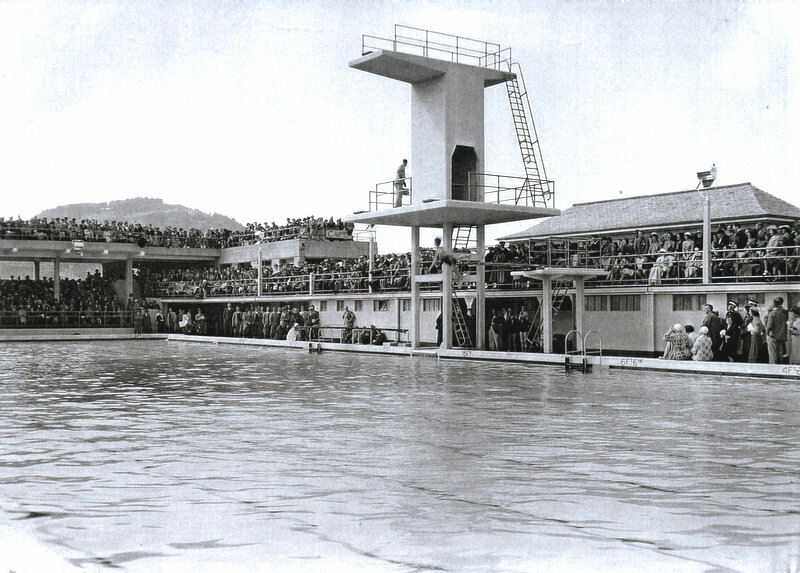 Western Counties High Diving Champion 14 years old Jane Selby of the Bath Dolphins and Coate Swimming Club opened the programme by beautiful swallow diving from the top board 33 feet high, into the 15 ft.depth of shimmering crystal clear water. 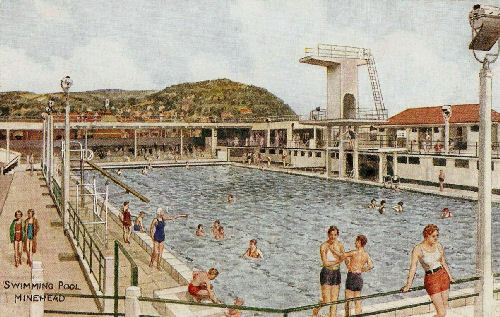 On 31st May 1958 it was reported in the Somerset County Herald that Col. Luttell was not prepared to open the swimming pool that summer and it was sold to a group of Minehead business men. 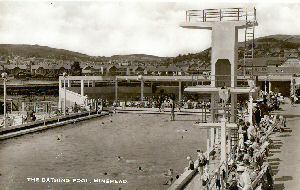 Minehead UDC never owned the Lido. 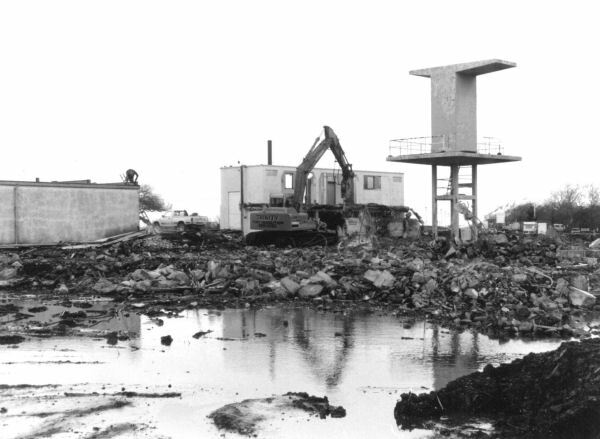 When Mr.Luttrell decided to sell it, the council was advised not to buy it due to concrete cancer and the need for a new pumping station on the beach. 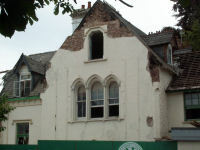 However, a group of Minehead businessmen decided to buy it - these included Jack Ridler, Bernie Culverwelll and hoteliers Ivor Cornish, Lionel Bush and Harry Strawbridge among others. As an apprentice for J Burgess and Sons, I helped create an additional entrance on the west end of the lido as access to a new restaurant in the west stand. 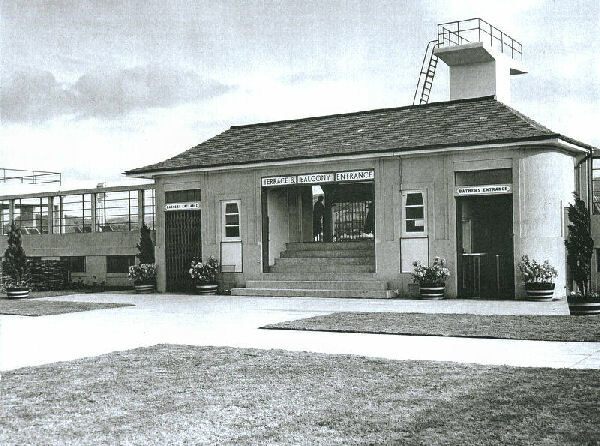 We also built a new building at the front of the Lido; this was used as an amusement arcade and was run by a family from bristol who had connections with Charlie Heals Fair. 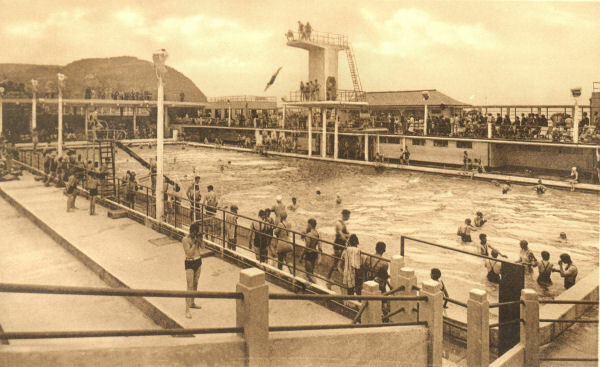 After some years when Mr Butlin wanted to extend his camp towards the town, the businessmen sold the lido to him. He ran it for a few years and then sold it to a development company. 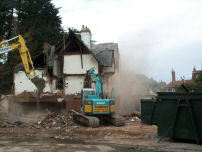 This company then demolished the pool and built the blocks of flats houses and bungalows that we can see today. The non-purchase of the Lido site by the council was perhaps another error that they made through lack of vision. and it was demolished in 2009 and is now a Lidl supermarket. The Aquasplash site became a bus park once it was demolished. Obviously Morrisons having taken over the previous bus park, another was needed. The people of Minehead should expect a “long journey” on the road to once again having a community swimming pool on their doorstep. Cllr Neil Parbrook, West Somerset Council’s lead member for community, issued the warning after the authority’s cabinet approved the commissioning of a feasibility study last Wednesday (August 5th 2009). The council will now appoint a consultant to complete the study into a new pool on grounds at the West Somerset Community College. The study will outline the design, costs and need for a new pool. The new pool would replace the ill-fated Aquasplash, demolished at the end of last year. The pool was closed in 2007 after a major leak was discovered. The council later said it was not financially viable to keep it open. 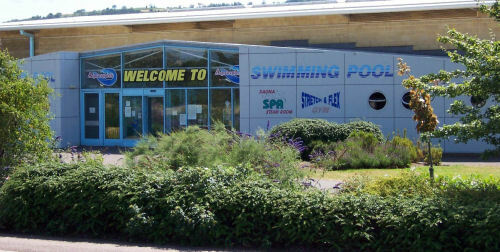 And in 2008 hopes for a new pool were raised when council chiefs unveiled plans for a new multi-million pound replacement facility on the college’s grounds as part of the New Horizons project. But the council had to pull the plug on the plan because of financial problems. WE HAVE TO DRIVE 45 MINUTES TO OURS! "I WISH WE HAD ONE LIKE THIS IN PENARTH"....>> I WISH WE HAD ONE LIKE THIS IN MINEHEAD !!! WHATEVER THE STATE OF THE TIDE. IN THE COFFERS TO DO SOMETHING FOR THE TOWN! That makes 3 rather essential amenities for a seaside town that we do not have anymore. surely theres enough rates coming in to provide a replacement swimming pool ? and why would the council want to waste money on a feasibilty study? Of course we should have a proper top class swimming pool, theres no question about that! But we still have a golf course ! Warren House was the home of the Warrener, he was the gamekeeper for the Luttrell family. The house had a lookout on its roof to watch for herring shoals. Below are a couple of pictures of the Hotel Metropole which was built in 1892. 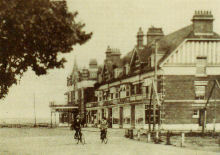 It stood in 4 acres of grounds in the centre of the promenade facing the sea. 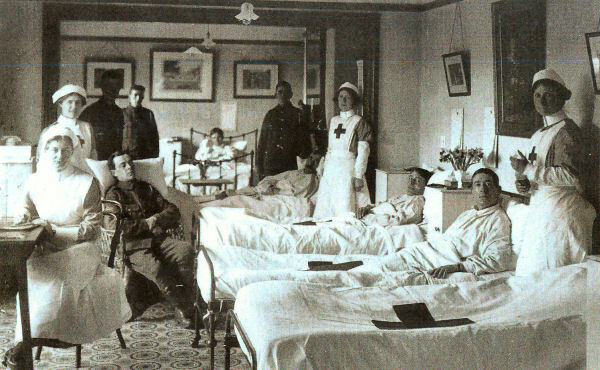 It had 60 bedrooms, spacious reception, billiard, smoking rooms and private sitting rooms. Croquet and tennis lawns, first class stabling, cariages, hunters and accomodation for motors. 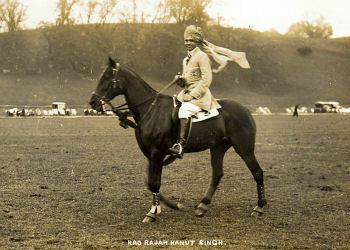 It was often used by the Indian Rajahs when they came to play polo at Dunster. but kept a public bar which is called the Hobby Horse.